Microsoft has just announced the Surface Go tablet for $399 which is going to compete against the entry level Apple iPad, which currently retails for $329. The Surface Go basically looks like a smaller version of the Surface Pro 3. This device is going to have a 3:2 aspect ratio display and a resolution of 1800 x 1200. Underneath the hood is an Intel Pentium Gold 4415Y processor with either 4 or 8GB of RAM and 64 or 128GB of storage. The processor is a dual-core seventh-generation model, which Microsoft says was chosen because of its balance between performance, battery life, and thermal properties that allow for a thin, fanless design. The company says the Go has up to nine hours of battery life as a result. The Go will run Windows 10 with S mode enabled, which means you can only install apps from the Microsoft App Store. You will be able to upgrade to a full version of Windows 10 Home for free, if you want a full desktop experience, but you likely will sacrifice battery life. 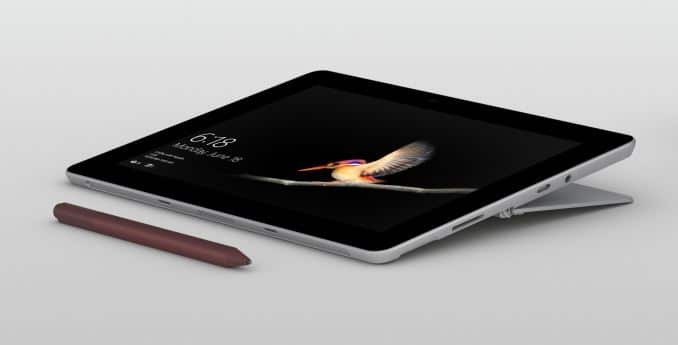 The Surface is bundled with their signature built-in kickstand with unlimited positions, a front-facing camera with facial recognition login, and Microsoft’s proprietary Surface Connector port for charging and connecting to a desktop dock. Microsoft has added a USB-C 3.1 port, capable of charging the tablet or outputting video and data to external devices. It has also rounded the corners a bit compared to the latest Surface Pro, but overall, it’s the same familiar magnesium design Surface users have come to expect. Preorders for two hardware variants at four price points start today in the US, Canada, Australia, New Zealand, Hong Kong, UK, Ireland, France, Germany, Austria, Belgium, Luxembourg, Netherlands, Switzerland, Denmark, Finland, Norway, Sweden, Poland, Taiwan, Italy, Portugal, Spain, Malaysia, and Thailand. In the future, versions of Surface Go with integrated LTE and 256GB SSDs will be added to the line-up.